To What Extent Should Nation Be The Foundation of Identity? 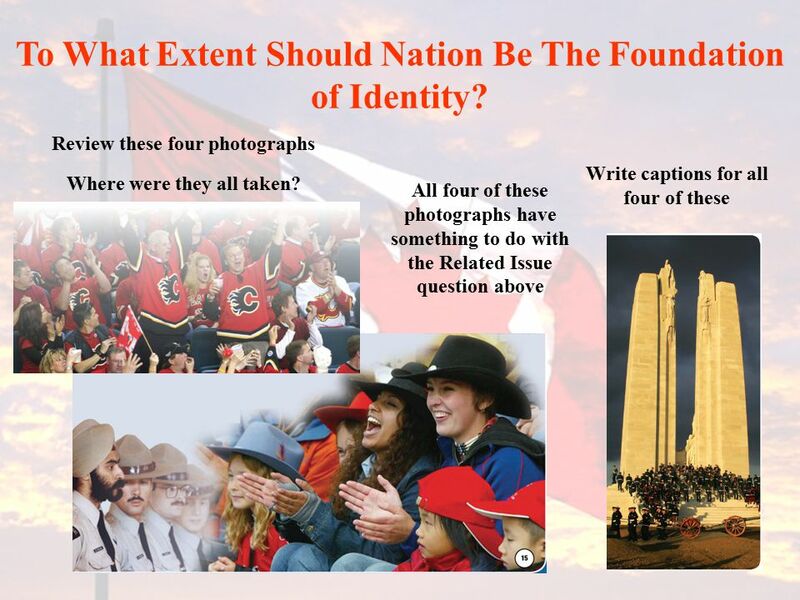 1 To What Extent Should Nation Be The Foundation of Identity? 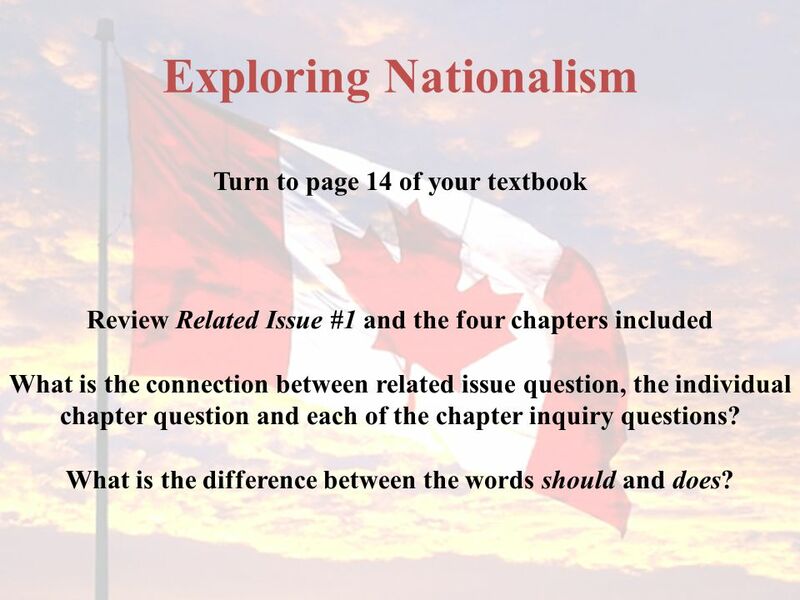 Turn to page 14 of your textbook Review Related Issue #1 and the four chapters included What is the connection between related issue question, the individual chapter question and each of the chapter inquiry questions? 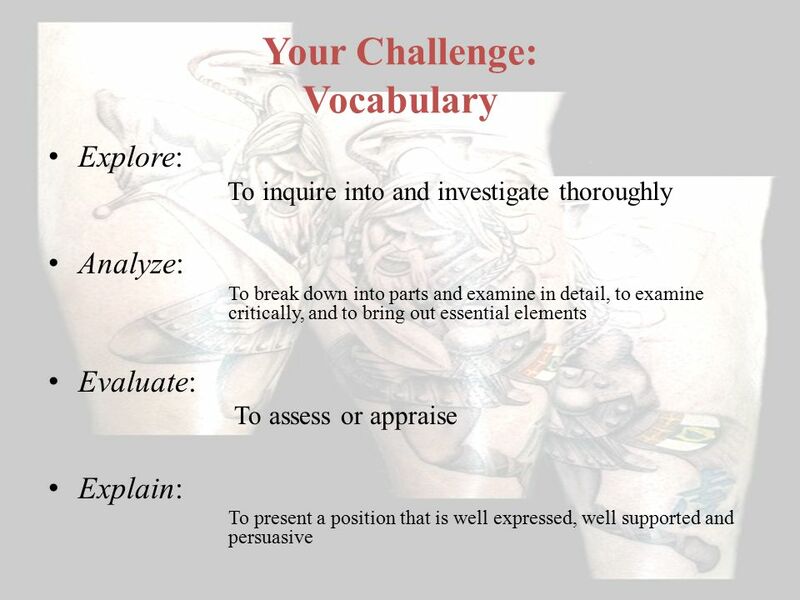 What is the difference between the words should and does? What is the main idea of this section? 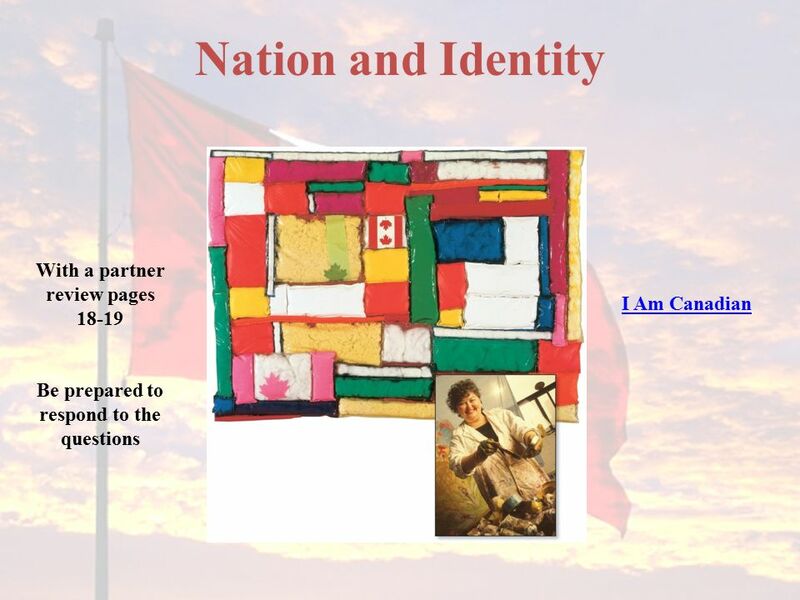 In what ways is a national identity similar to an individual identity? What is the main difference between a nation and a nation-state, or country? What are a few examples of how nationalism has been used – anywhere or at any time, for good and evil – to exploit people’s feelings? 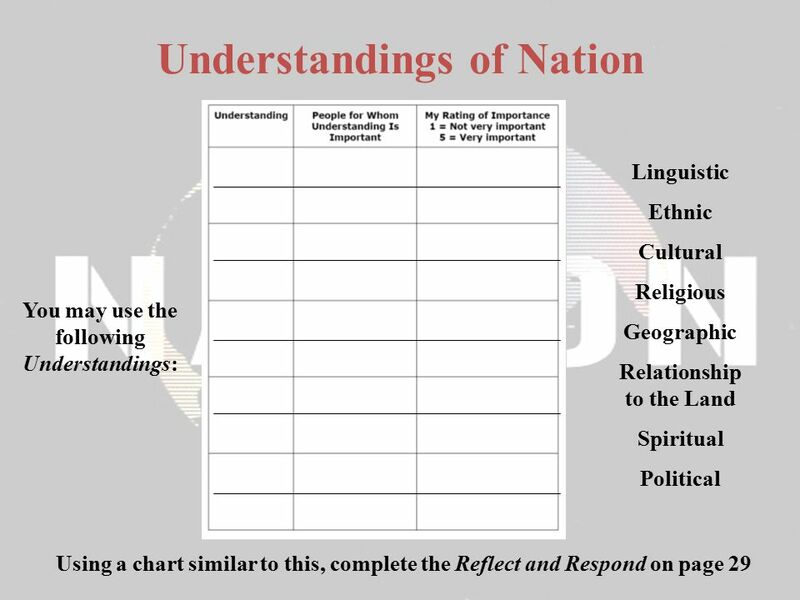 10 What Are Some Concepts of Nation? 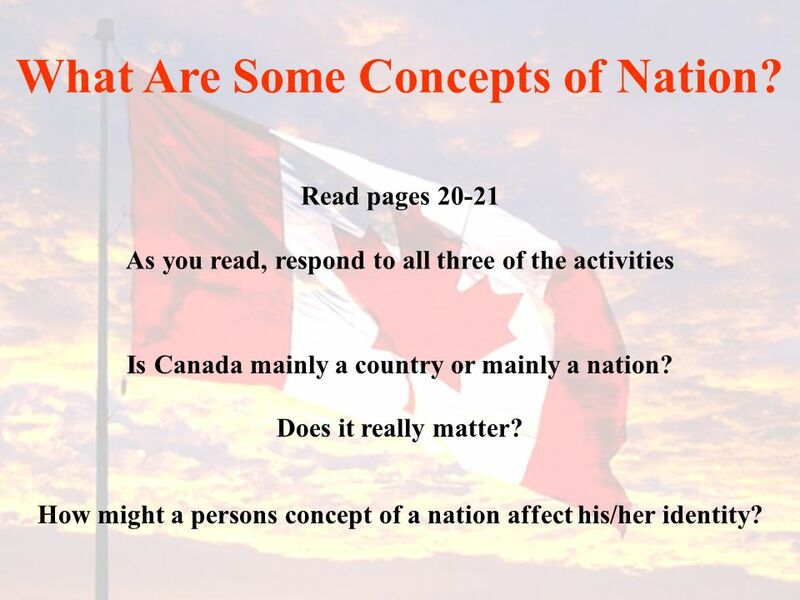 Read pages As you read, respond to all three of the activities Is Canada mainly a country or mainly a nation? Does it really matter? 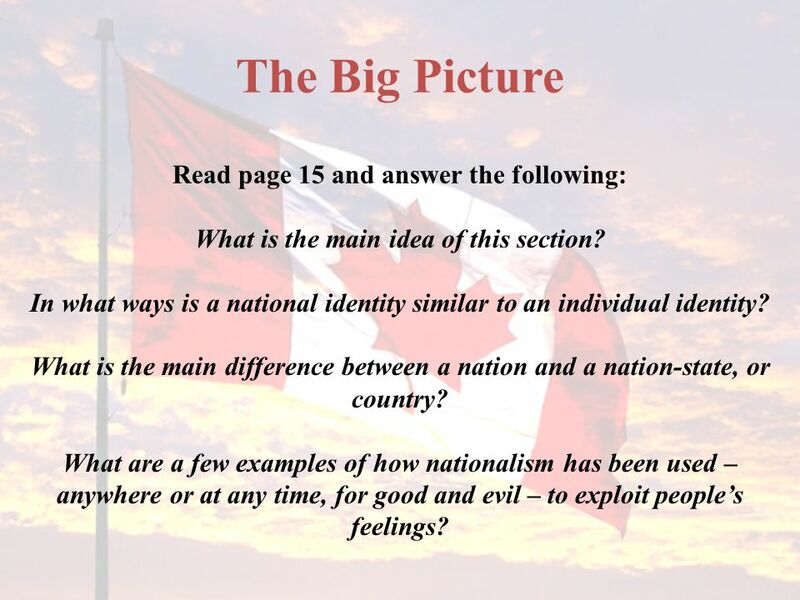 How might a persons concept of a nation affect his/her identity? 13 Dying for one’s nation is the highest expression of patriotism! True? 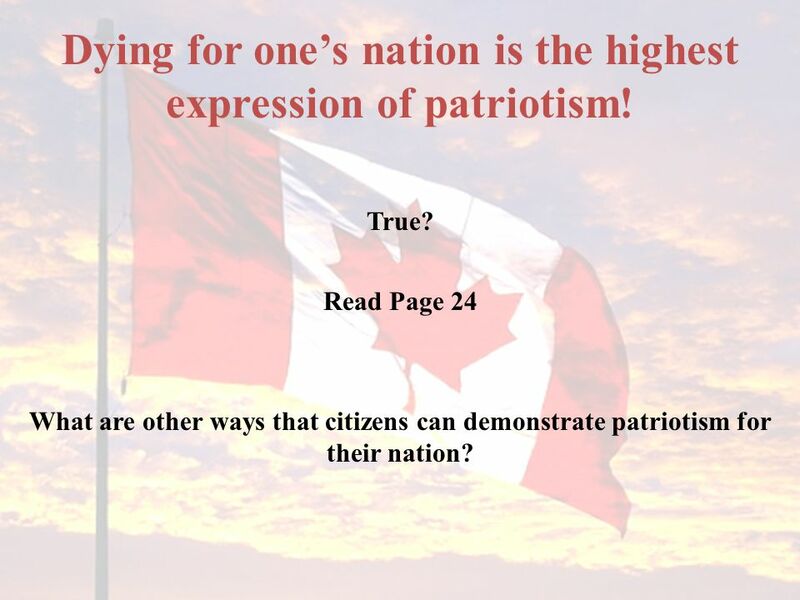 Read Page 24 What are other ways that citizens can demonstrate patriotism for their nation? 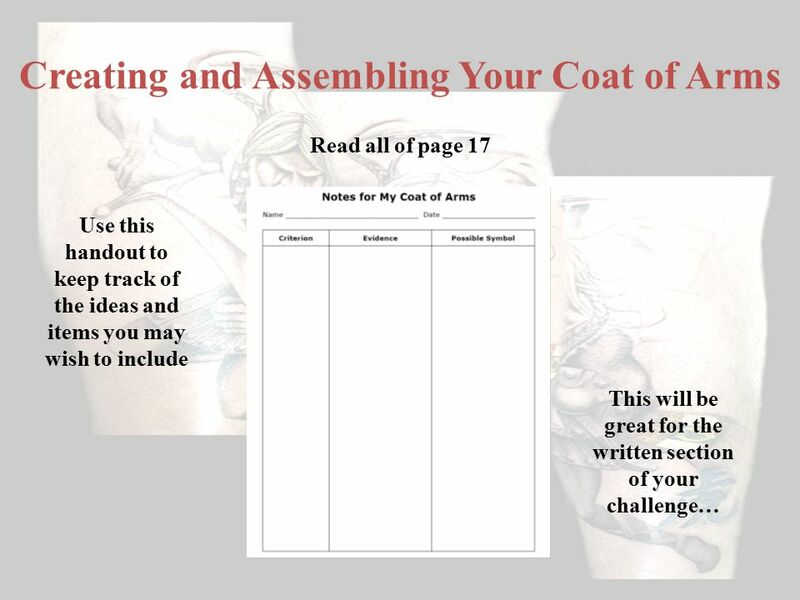 Any term/phrase/concept that would be considered important in helping you with your … Coat of Arms Any suggestions as to what you should include? 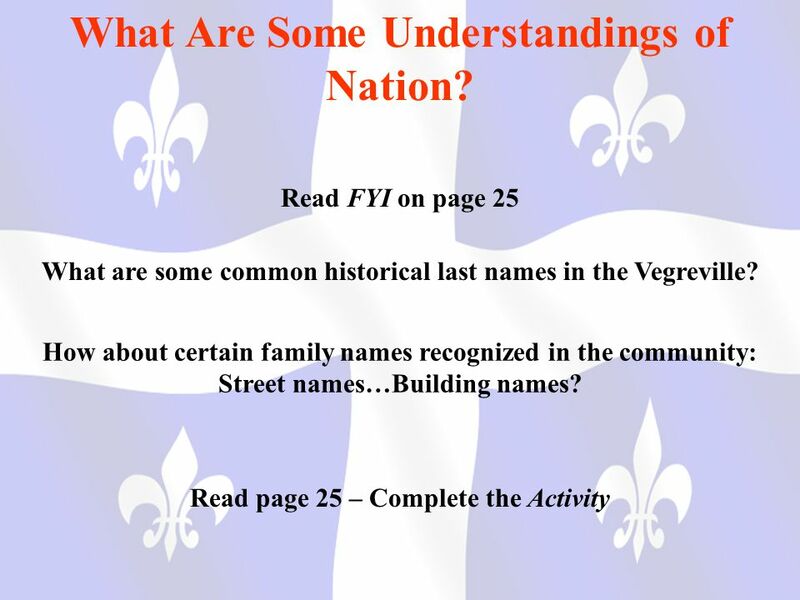 16 What Are Some Understandings of Nation? 18 Belief’s or Geography? What affects your identity more, your personal beliefs or where you live? 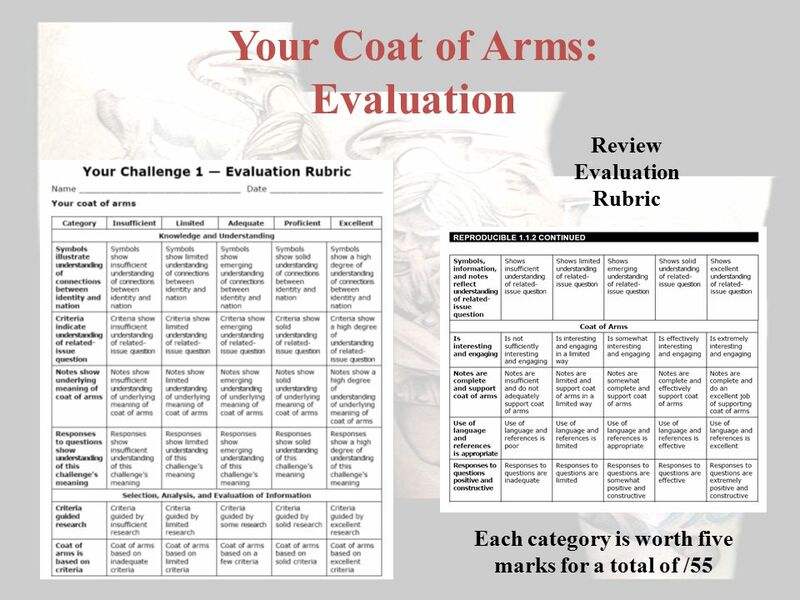 On page 27, review Voices, the two photographs and the Activity Does this change your answer to the question above? 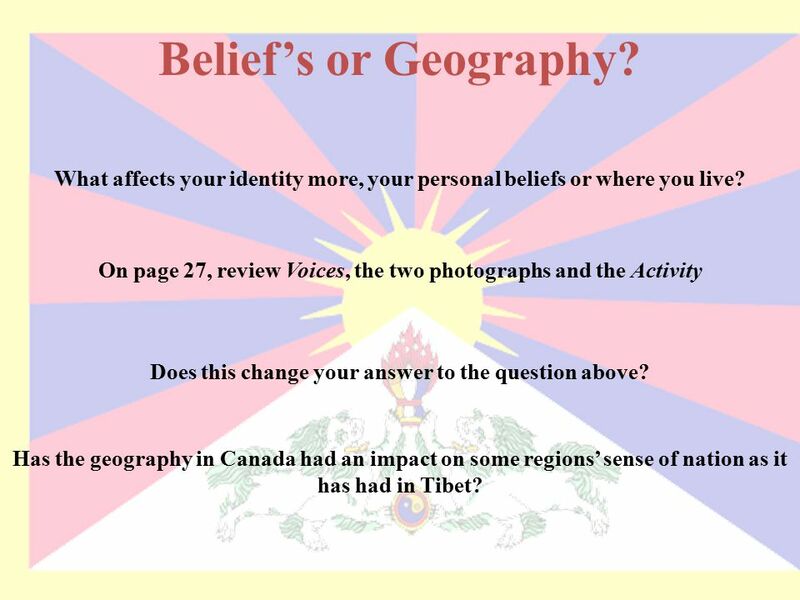 Has the geography in Canada had an impact on some regions’ sense of nation as it has had in Tibet? 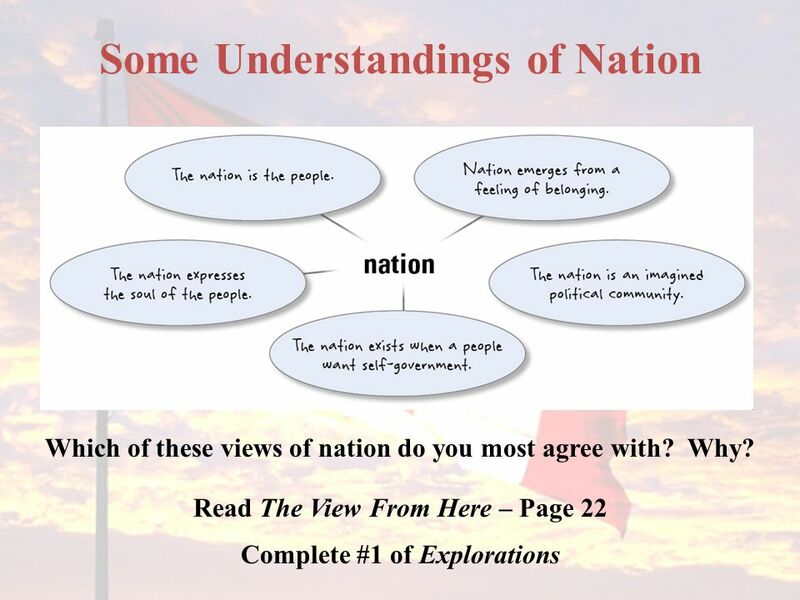 19 Political Understandings of Nation? 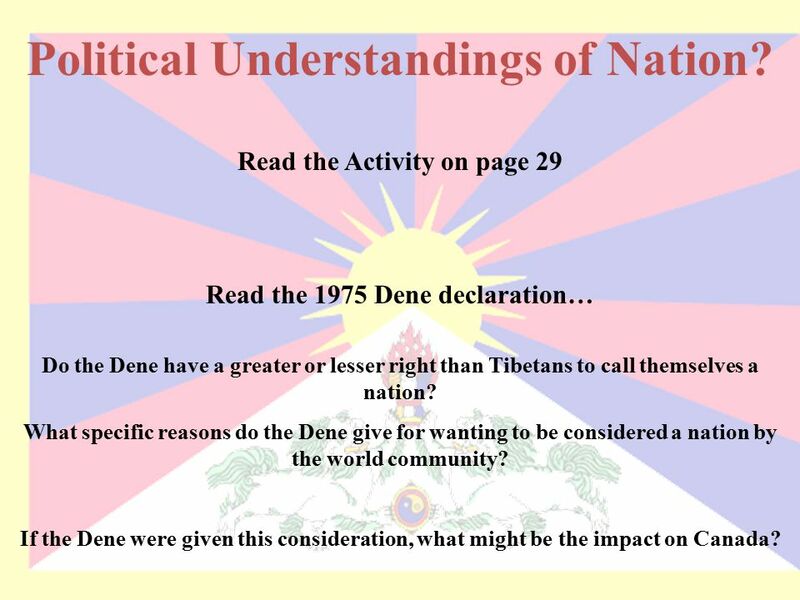 Read the Activity on page 29 Read the 1975 Dene declaration… Do the Dene have a greater or lesser right than Tibetans to call themselves a nation? 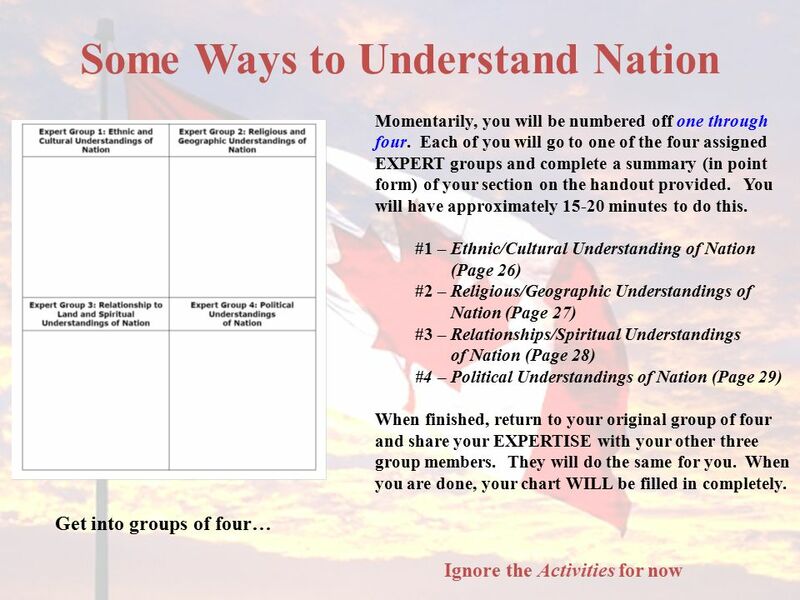 What specific reasons do the Dene give for wanting to be considered a nation by the world community? If the Dene were given this consideration, what might be the impact on Canada? 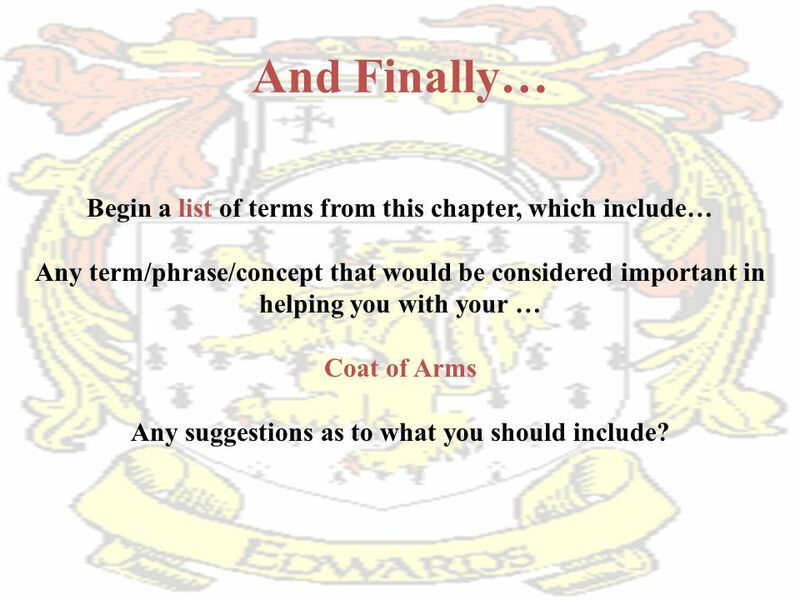 21 And Finally… Continue with your list of terms from this chapter, which include… Any term/phrase/concept that would be considered important in helping you with your … Coat of Arms Any suggestions as to what you should include? 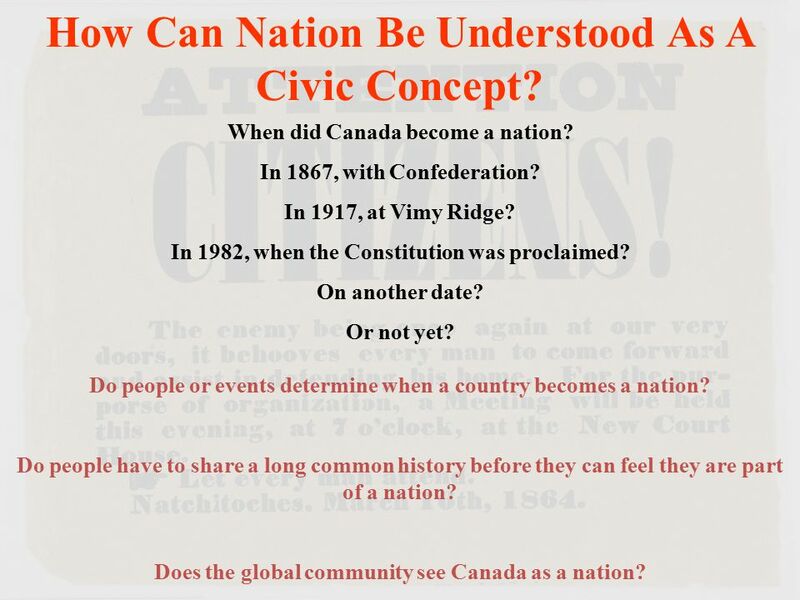 22 How Can Nation Be Understood As A Civic Concept? When did Canada become a nation? In 1867, with Confederation? In 1917, at Vimy Ridge? In 1982, when the Constitution was proclaimed? On another date? Or not yet? Do people or events determine when a country becomes a nation? Do people have to share a long common history before they can feel they are part of a nation? 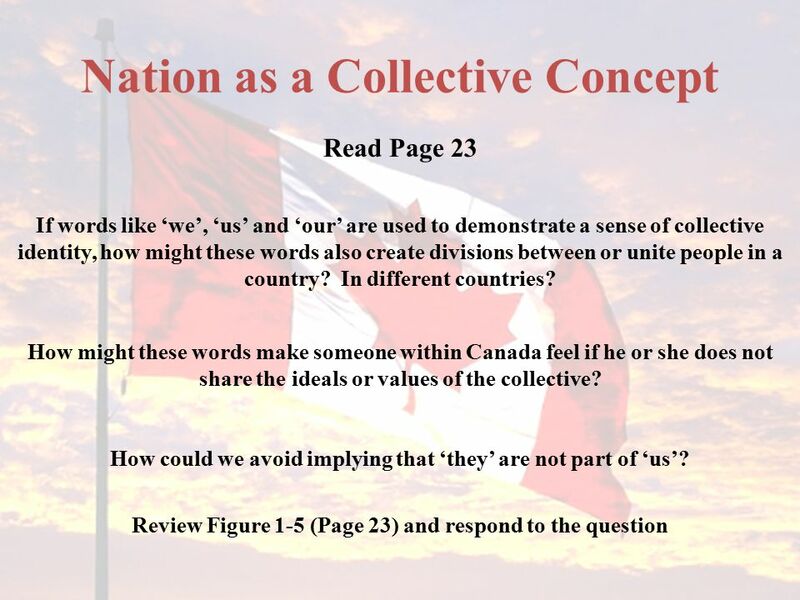 Does the global community see Canada as a nation? 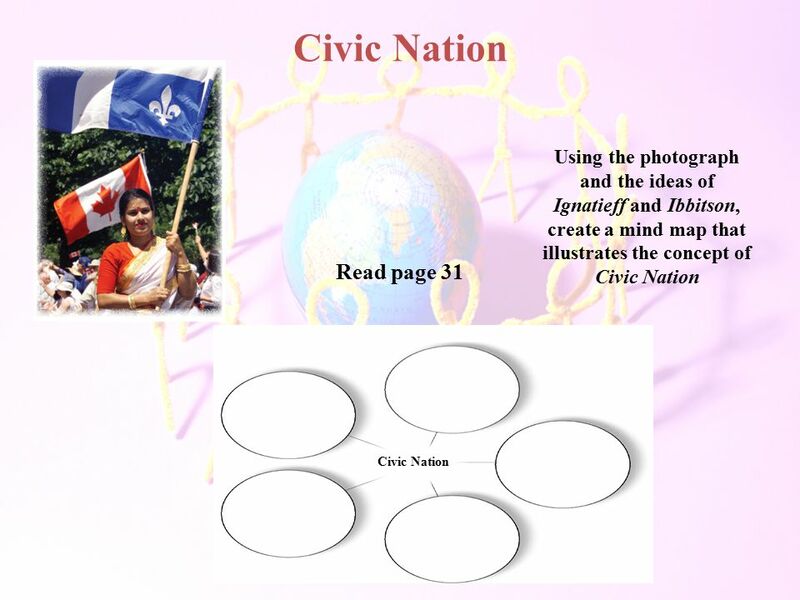 23 How Can Nation Be Understood As A Civic Concept? 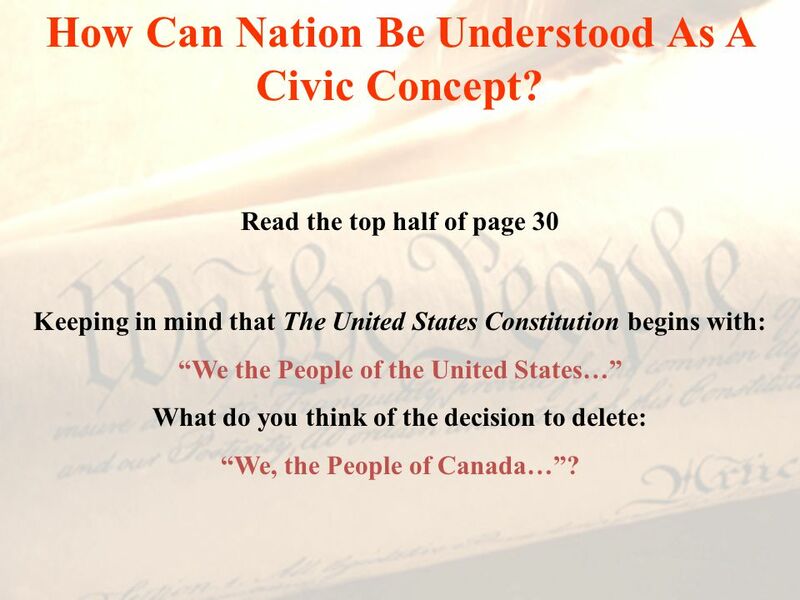 Read the top half of page 30 Keeping in mind that The United States Constitution begins with: “We the People of the United States…” What do you think of the decision to delete: “We, the People of Canada…”? 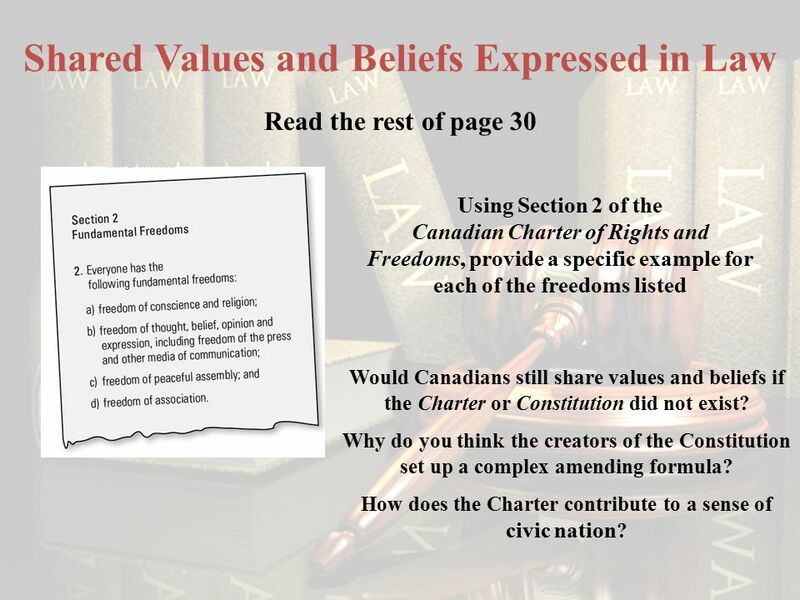 Read the rest of page 30 Using Section 2 of the Canadian Charter of Rights and Freedoms, provide a specific example for each of the freedoms listed Would Canadians still share values and beliefs if the Charter or Constitution did not exist? Why do you think the creators of the Constitution set up a complex amending formula? How does the Charter contribute to a sense of civic nation? 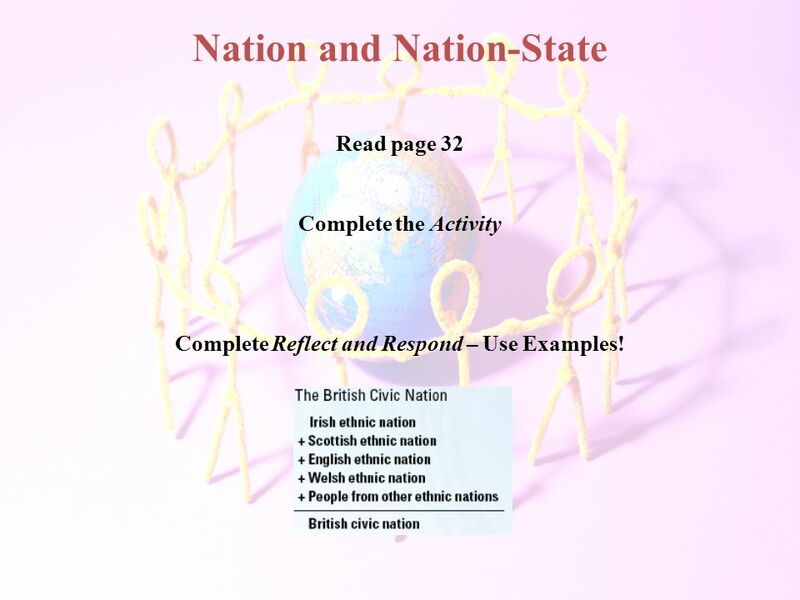 26 Nation and Nation-State Complete Reflect and Respond – Use Examples! 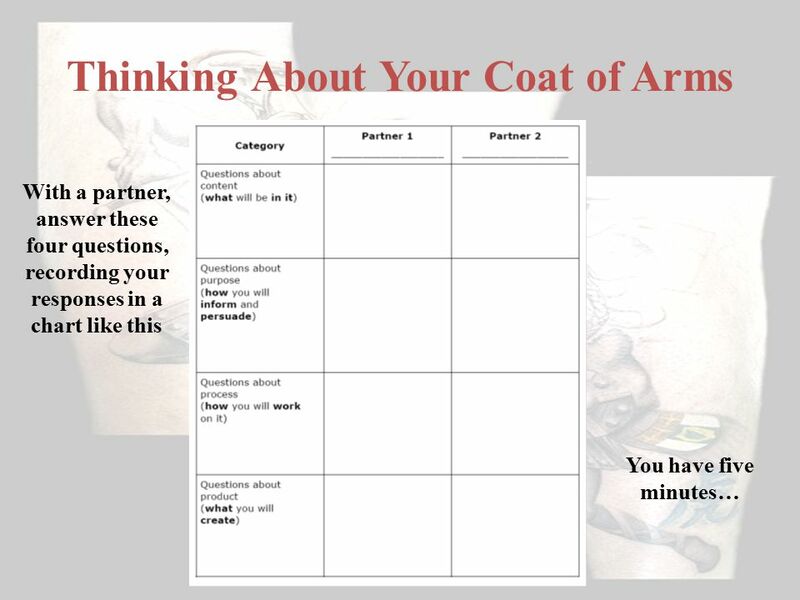 Read page 32 Complete the Activity Complete Reflect and Respond – Use Examples! 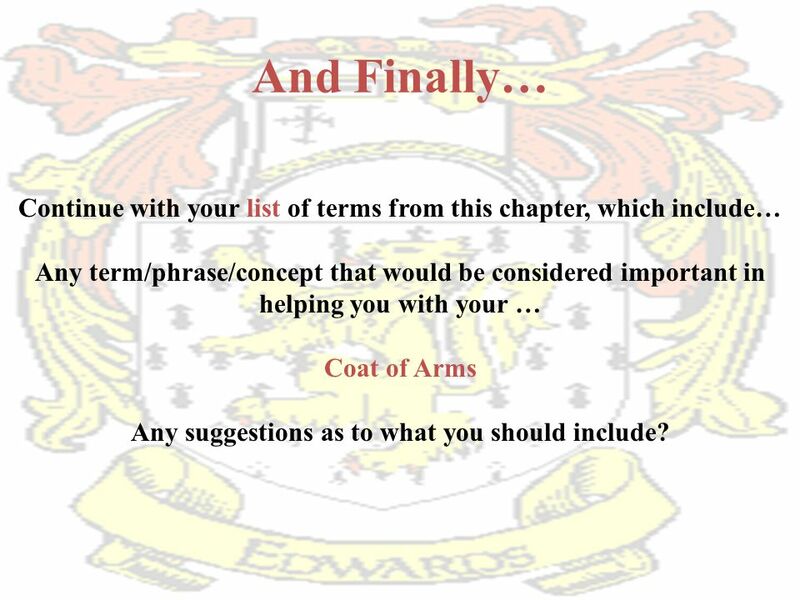 27 And Finally… Continue with your list of terms from this chapter, which include… Any term/phrase/concept that would be considered important in helping you with your … Coat of Arms Any suggestions as to what you should include? 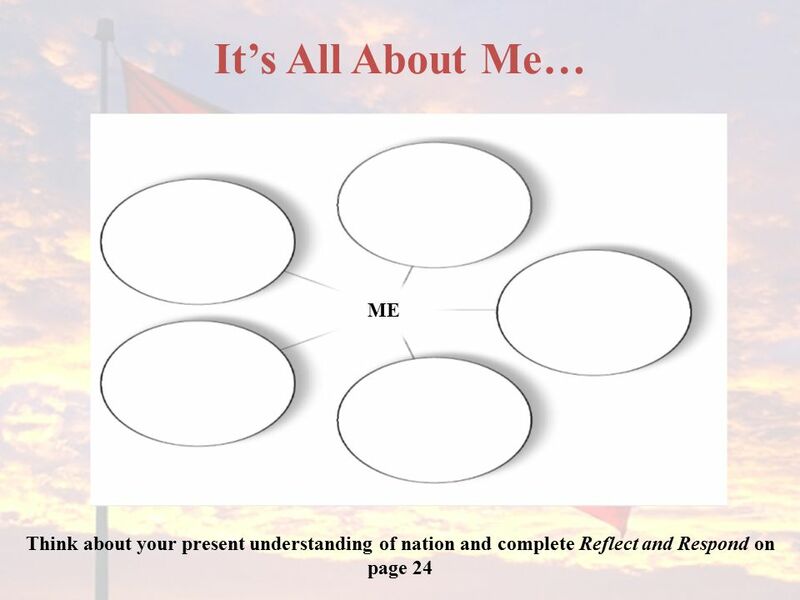 Download ppt "To What Extent Should Nation Be The Foundation of Identity?" Understanding the Biblical World View. 2 The 4 Basic Questions of Life Where am I? What is the nature of the universe/world? Who am I? What is my nature/task/purpose. 2-1 Chapter 2: Preschool English Learners, Their Families and Their Communities ©2012 California Department of Education, Child Development Division with. Right vs. Left Brain. This theory of the structure and functions of the mind suggests that the two different sides of the brain control two different.